A quick note to wish everyone the best of the Holiday Season. No matter how - or what - you celebrate I hope everyone has a great time with family and friends. 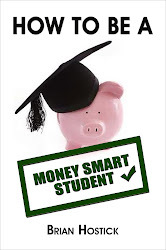 Money Smart Students will be launching officially very soon so keep a look out for that. Any good financial plan heading into college or university must include one thing - NO CREDIT CARDS!! Do you really need that t-shirt they're offering to get you to sign up? Luckily - there are some new rules in place restricting the marketing of credit cards to very young students - but everyone else is fair game. Studies show that students with access to a credit card will max that card out - regardless of the limit - before the end of their first year! That means you'll be working a lot of the next summer just to pay off your credit card bill from things you did and bought over the past 10 months. I'm sure you could find a better way to use all that money. Try saving a little extra before you head off to school so the credit card can stay put away and only be used for dire emergencies. If you do have to use your card - try with everything you have to pay it off in full when you get your next statement. You'll reduce your interest charges and you'll have a leg up on lots of other students who will be struggling to keep up with their credit card debt. There is one story which shows that some students are using their heads in regards to credit cards. A recent report in the Tennessean paper reported that Chase Bank in the United States spent nearly $1.4 million in 2009 marketing credit cards to students at the University of Tennessee. At the end of the promotion period a grand total of 9 - that's right - 9 new accounts had been opened!! Way to use your heads UT students!! Staying away from credit cards will move you one step closer to being ready for the real world.